It is a database engine developed in RDS. It is actually a spoke database engine developed by an Amazon. It was announced in re: invent 2014. It can run only on AWS infrastructure. It's not like a MySQL database that can be installed on a local device. It is a MySQL -compatible, relational database engine that combines the speed and availability of high-end commercial databases with the simplicity and cost-effectiveness of open source databases. It serves up to five times better performance than MySQL at a price one-tenth of that Commercial databases while delivering similar performance and availability. If we start with 10 GB, and we exceed the 10 GB, then it automatically scaled up to 10 GB storage. 10 GB can be incremented up to 64 TB. Compute resources can scale up to 32VCPUs and 244 GB of memory. It maintains 2 copies of your data in each availability zone, with a minimum of three availability zones. Therefore, we can say that it maintains 6 copies of your data. It is designed to transparently handle the loss of up to two copies of data without affecting database write availability and up to three copies without affecting read availability. It is highly redundant. It is also self-healing means that data blocks and disks are continuously scanned for errors repaired automatically if the errors have been detected. Aurora Replicas are the separate points in an Aurora DB cluster which is used for scaling read operations and increasing availability. It can distribute up to 15 Aurora Replicas across the Availability Zones. The DB cluster volume is made up of multiple copies of data, and the data in a DB cluster volume is represented as single to Aurora Replicas in the DB cluster. All the Aurora Replicas return the same result of a query. Aurora replicas perform well for read scaling not for write operations as they are fully dedicated to the read operations in DB cluster. Write operations are mainly managed by a primary instance. Aurora Replicas are set as failover targets to increase the availability, i.e., if Aurora instance fails, then the Aurora Replica is promoted as a primary instance. If Aurora DB cluster does not include Aurora Replicas, then you need to recreate the DB instance to recover from the failure event. Aurora Replica is faster than the recreating the DB instance. It can create up to 5 Read Replicas across the Availability Zones. It enhances the availability of DB instance, and this feature can scale out the capacity of a single DB Instance for read-heavy database workloads. You can create more than one replica of a source DB instance and can serve a large volume of application read traffic from multiple copies of your data, thus increasing the read throughput. It provides a feature of fault-tolerant and self-tolerant storage. It offers a more than 99.99% availability, replicating 6 copies of data, i.e., 2 copies each across three availability zones and backing up the data to S3 continuously. It recovers from the physical storage failure in less than 30 seconds. With the Global Database, a single Aurora database can spread across multiple AWS regions to provide faster read and disaster recovery. An Amazon Aurora provides multiple levels of security to your database. It provides network isolation using Amazon VPC, encryption using keys that you create and control through AWS Key Management Service. Amazon Aurora serves up to five times better performance than MySQL at a price one -tenth of that Commercial databases while delivering similar performance and availability. You can scale up or scale down resources as your needs vary. The storage can be incremented up to 64 TB per database instance. For example, if we start with 10 GB and we exceed 10 GB, then the storage size scaled up to 10 GB automatically. 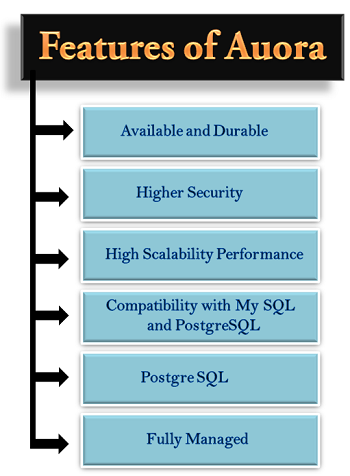 An Amazon Aurora is fully compatible with MySQL and PostgreSQL. This means that you can easily migrate from MySQL or PostgreSQL to Aurora using MySQL or PostgreSQL import/export tools. The code, applications, drivers, and tools that you use with the existing databases can also be used with the Amazon Aurora. An Amazon Relational database service completely manages Amazon Aurora.You do not have to worry about various database management tasks such as hardware provisioning, software patching, setup, configuration or backups. An Amazon Aurora continuously backs up the data to Amazon S3 and provides point-in-time recovery. You can also monitor your database performance by using Amazon CloudWatch which is a tool used to detect the performance problems quickly.